Tyeler Matsuo and Julia Meisel, of the Rocky Mountain Institute (RMI), explore climate auctions. This 21st century alternative to grants and loans uses competitive bidding to disperse public funding to carbon-reducing projects. With scientific reports warning of the urgency of concerted climate action, and with current national climate targets leaving us far short of what’s needed to avoid the most dangerous impacts of climate change, policymakers around the world must find ways to kick-start the low-carbon transition. To succeed, they face the challenge of not only translating commitments into action, but also finding ways to finance and scale these actions. A new brief from Rocky Mountain Institute and the World Bank, Climate Auctions: A Market-Based Approach to National Climate Action, shows how climate auctions can be a powerful tool to help emerging and developing countries achieve ambitious climate targets. Auctions are all the buzz in the renewable energy space, with results showcasing the benefits of combining the right incentives with the agility and innovation of the private sector. Yet auctions are not just limited to renewable energy: at the international level, climate auctions have already proven effective in stimulating private investment into mitigation projects that reduce methane and nitrous oxide emissions, with enormous potential to unlock economy-wide climate action at the national level. Think of climate auctions as a 21st-century alternative to up-front grants and loans, which for decades have been the dominant means for allocating public funds for climate and development projects. While these traditional public finance instruments can be crucial tools in developing country contexts, they can involve complex administrative processes and offer no guarantee that results will be achieved. 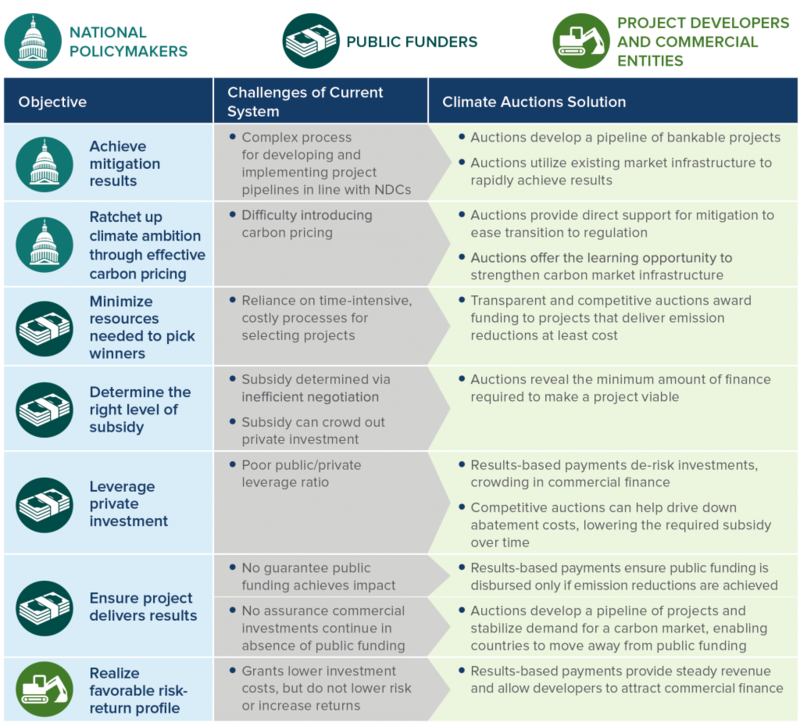 Rather than disbursing finance up-front, climate auctions competitively allocate public funding to commercially developed mitigation projects only upon delivery of climate outcomes. This helps ensure transparency in selection processes, greater achievement of results, and efficiency in leveraging private investment. 1. Public funders — which can include international sources (e.g., bilateral development agencies, multilateral climate funds), national sources (e.g., national climate or environment funds), or a mix — commit to funding climate mitigation projects through the auctions. 2. Project developers and commercial entities compete in an auction to receive a share of this funding. Each bidder submits his or her price for delivering emission reductions from a mitigation project, and the most cost-competitive bidders are awarded a price guarantee. 3. Auction winners then develop mitigation projects, generating third-party verified emission reductions. The price guarantee that they hold gives them the right — but not the obligation — to sell their emission reductions back to the auction facility at the price cleared in the auction. Alternatively, a developer can choose to sell to a competitive carbon market if the market price exceeds its guaranteed price.While climate auctions work best alongside existing carbon markets — giving auction winners the option to earn higher returns and public funders the opportunity to redirect their unused finance to support other climate projects — the existence of a carbon market is not necessary for climate auctions to work. Where there is no secondary carbon market, auction winners simply redeem their price guarantees with the auction facility. Most countries have outlined priority sectors for climate action in their nationally determined contributions, but translating sector targets into a pipeline of actual projects—and figuring out how to finance these projects — can prove a daunting task. Climate auctions directly engage the private sector by providing attractive and easy-to-access investment incentives. This direct support closes cost viability gaps and reduces risk, which means greater interest from project developers and commercial financiers. In doing so, policymakers leverage the strength of the private sector in developing a pipeline of viable mitigation projects, mobilize private finance, and develop an ecosystem better equipped to take on future mitigation projects. For public funders, climate auctions offer a relief from some of the pitfalls of traditional up-front grant financing. Climate auctions can help drive down mitigation costs and leverage private investment, ensuring funders achieve the best bang for their buck. The competitive process also helps funders decide how best to allocate their resources: because climate auctions transparently reveal the minimum amount of finance required to make a mitigation project commercially viable, public funders don’t have to spend time and resources trying to determine the level of subsidy a project needs to be viable and who should receive this subsidy. Finally, because developers receive payments only upon presenting verified emission reductions, the climate auction model helps ensure that public funds actually achieve climate outcomes. Like any public finance instrument, the scarcity of public resources limits the direct scalability of climate auctions. Still, climate auctions are an efficient tool to kick-start mitigation activities in priority sectors, build private-sector capacity to engage in climate action, and strengthen national infrastructure for measuring, reporting, and verifying emissions generated from different projects. All of these features are important building blocks for increasing climate ambition. Unlike other support schemes that only achieve results with continued public funding, climate auctions offer a pathway toward self-sustaining and scaled-up climate action. Specifically, as more and more countries seek to put a price on carbon, policymakers can utilize climate auctions as a stepping stone to economy-wide carbon pricing or other regulatory schemes. In some sectors, introducing effective carbon pricing or other regulatory policies may be difficult due to industry opposition. Instead of directly regulating or pricing emissions, climate auctions can provide a direct incentive to stimulate investments in these sectors. This initial support can provide industries the chance to build capacity and make the necessary investments before regulation exists. Developing this groundwork is a crucial step for introducing more economy-wide carbon pricing policies or engaging in future international carbon markets. Auctions are an innovative tool to spur private investment in low-carbon activities in the near term, while laying the groundwork to mobilize finance at the scale and pace needed to meet longer-term climate and development goals. 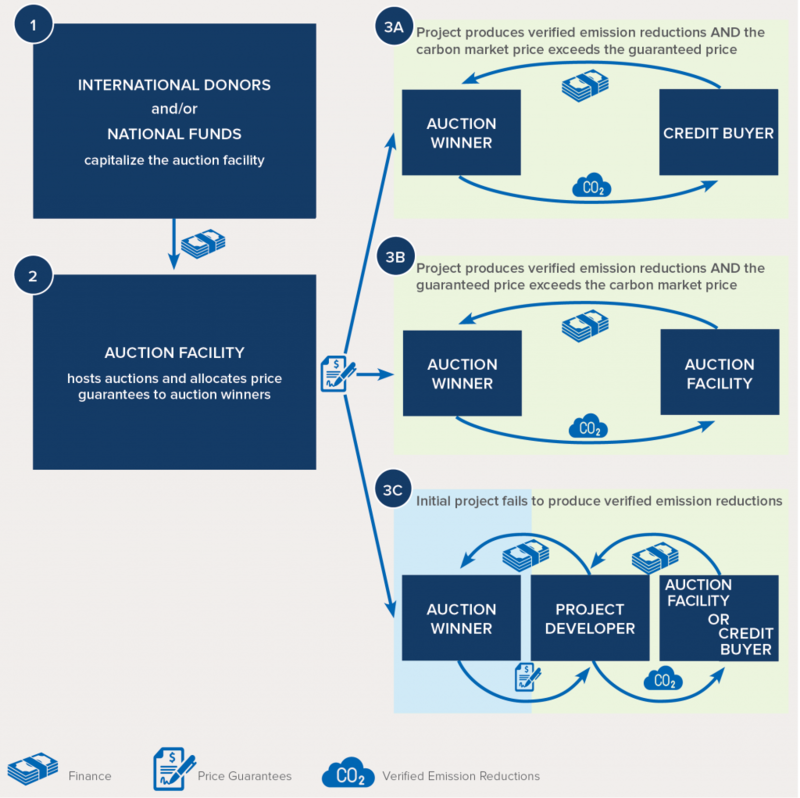 Auctions help ensure the greatest climate impact of scarce public resources: not only can auctions be organized at low administrative cost and with high transparency, they use the market to discover the minimum subsidy level required to spur investment and only pay out once emission reductions have been verified. At the same time, climate auctions help strengthen carbon market-readiness. In doing so, climate auctions can act as a transition tool to establishing the regulatory frameworks that can enable achievement of more ambitious, self-sustaining climate outcomes over time. So how might national policymakers interested in this model decide whether climate auctions are right for them? And which sectors or technologies are best suited for climate auctions? Download Climate Auctions: A Market-Based Approach to National Climate Action to find out more. Tyeler Matsuo is an associate and Julia Meisel a senior associate, both for global climate finance at RMI. 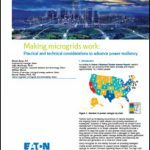 This article orginated on RMI’s Insight Blogs and was reposted with permission.